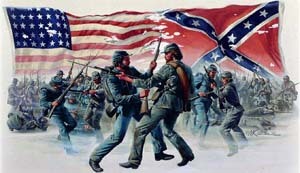 The American Civil War was fought during 1861, 1862, 1863, 1864 & 1865. Issues involving the slavery for the North and states rights for the South erupted into a full-scale war following the election of Abraham Lincoln in 1860. Eleven southern states (Alabama, Arkansas, Georgia, Louisiana, Mississippi, North Carolina, South Carolina, Tennessee, Texas and Virginia) declared their secession from the United States and formed the Confederate States of America, also known as "the Confederacy". Twenty-Two mostly-Northern states (California, Connecticut, Delaware, Indiana, Illinois, Iowa, Kansas, Maine, Minnesota, Massachusetts, Michigan, New Hampshire, New Jersey, New York, Ohio, Oregon, Pennsylvania, Vermont, Rhode Island, Wisconsin) formed the Union. The Border States (Maryland, Kentucky, Missouri) began with both Union and Confederate Governments till near the end of the war. The war began on April 12, 1861, when Confederate forces attacked Fort Sumter. and ended on June 22, 1865 with the Confederate raider CSS Shenandoah firing the last shot of the Civil War in the Bering Strait, more than two months after General Lee's surrender at Appomattox. Civil War records feature everything from personal accounts to historic writings that would shape a nation. Explore vivid details of Civil War battles through maps and photos. Get a personal picture of the war through Union and Confederate soldier service records, pension files, and more.